Telor Tactical Tagalong Ballistic Armor Holster has potential. Telor Tactical is a relatively new manufacturer of law enforcement and civilian holsters, but they produce some very nice options to the market. Made primarily from neoprene, nylon and Velcro, the Telor Tactical holsters are designed for comfort, fit, and practical use by on-duty police personnel and civilian CCP holders as well. Telor Tactical sent us a few of their products for an independent review, and this is our first on their ballistic armor holster. The BlueSheepDog Crew are strong advocates of carrying a back-up firearm, and the Telor Tactical Ballistic Armor Holster is an option for doing just that. The threats facing law enforcement today have only expanded, and the potential of a primary firearm going down from impact, malfunction, or even running out of ammo is all too possible. Having a secondary weapon on your person provides not only comfort in crisis, but a lifesaving tool in the event the worst case scenario unfolds. The Telor Tactical Tagalong ballistic armor holster. Telor Tactical is an up and coming product development company out of Appling, Georgia. The founder, David Leverett, brings over 20 years of experience in product development, design, and manufacturing and is dedicated to American made products. Leverett has surrounded himself with experienced experts with the goal of combining their in-house cut and sew operations expertise, with the creativity necessary to compete in an already very competitive holster market. 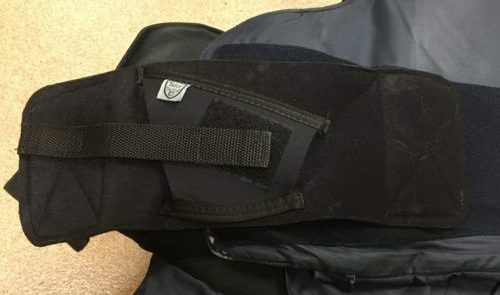 The Telor Tactical Tagalong Ballistic Armor Holster is one of the company’s holster options, particularly focused on law enforcement and security users. This holster was very interesting to me, because my department’s policy requires on-duty officers to carry their back-up firearms above the waist. In essence, I’m only allowed to carry a back-up pistol that is attached to my ballistic armor. Telor Tactical Tagalong easily attaches to body armor. With that limitation in place, I have tried several small holsters that I can attach to my ballistic armor straps for on-duty carry. Some have been better than others, but each had a weakness in its own right. From lack of a quality pistol retention strap, to poor holster attachments, each holster has left me wondering if (or when) it would fail. The Telor Tactical Tagalong Ballistic Armor Holster is made from very good materials. The backing is made from soft Neoprene that has large sections of Velcro to securely attach to an officer’s ballistic vest. The holster itself is also Neoprene, with a Nylon retention strap that is also secured with Velcro. I really enjoy this design, because it allows me to replace the (2) small vest straps with the Tagalong holster. This provides a much greater attachment of the two vest panels, as the smaller straps tend to fray and curl up over time. A Glock 27 was the back-up pistol during testing (photo by Glock). 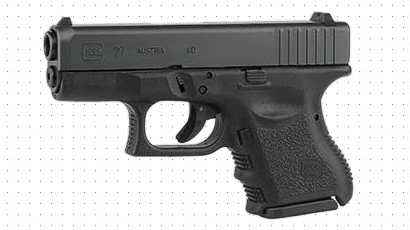 For this evaluation I used my Glock 27, .40 caliber pistol, with Hogue slide-on grips and a Scherer G27 1-shot baseplate extension. This is another requirement of my Department – that our back-up gun be the same manufacturer and caliber as our duty pistol. We carry Glock 22, .40 caliber pistols as our primary, so I’m limited to the Glock 23 or Glock 27 as realistic back-up pistols. The Glock 23 is just a bit too large for vest carry as a back-up pistol, though I really prefer its grip over the smaller Glock 27. The Scherer G27 1-shot extension grip really helps out with that however. The Telor Tactical Tagalong price is not beyond reason, and the features are very nice. However, with several other ballistic armor holster options for much less the rating on price has to drop a bit. During my evaluation of the Telor Tactical Tagalong I have found several very good features, but two very important questionable features as well. EDITOR’S NOTE: The ballistic armor used for this test is Point Blank, Level II. This review reflects my experiences with this product, and are the opinions of the author. It is possible another user may have an entirely different experience with this system. The large Neoprene backing combines lightweight and high durability, great features for any holster. The two ends have full-length Velcro patches that are 4.75 inches tall and 2.75 inches deep. This provides an incredible amount of gripping surface, and throughout my evaluation I have never had a problem with the backing becoming dislodged from my ballistic armor. The Telor Tactical Tagalong holster backing if fantastic, with significant Velcro. The Neoprene allows for a small amount of stretch and is stitched around the edges, as well as cross-stitched throughout the body for added support. The quality and craftsmanship of the backing are very good, and I have been very pleased with this part of the holster. As I mentioned before the moderately thick Neoprene backing is not only more than capable of mounting the holster, it can be used to substitute lesser quality ballistic armor straps. I have done this on my ballistic armor carrier, and it has worked out very well. 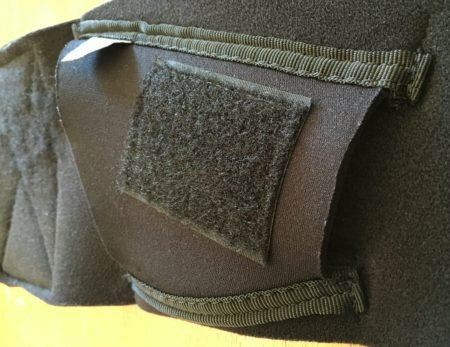 The backing has significant Velcro patches for attaching to your ballistic armor carrier, and the backing is large enough and thick enough to create a very comfortable and secure fit. The backing provides padding between the pistol and ballistic armor, increasing the comfort level significantly. The original armor straps have frayed and curled. 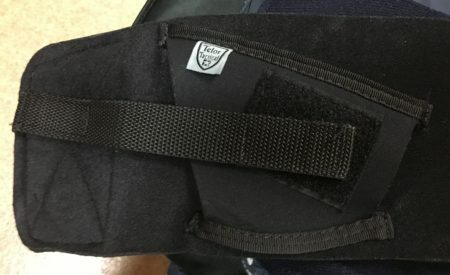 Telor Tactical advertises their holster selections as being “The Most Comfortable on the Market!” After several months of testing I must admit this ballistic holster set up has been the most comfortable of all the other holsters I’ve used on my ballistic armor. This includes options from Uncle Mike’s, Blackhawk, and even a couple of IWB holsters. The Tagalong provides great support for my Glock 27, and very good padding as well. The Neoprene backing is 3/16 inch thick and has proven to be very durable. The Neoprene Tagalong holster has double stitched nylon edges, and a Velcro patch on top for the retention strap. The Tagalong holster is also made of Neoprene, and is attached to the backing with double-stitching on a strip of nylon around the outer edge of the holster. The cut of the holster is designed for my type of back-up holster (sub-compact, double-stacked) and my Glock 27 slides into the holster very nicely. The Tagalong holster is sewn in about a 15-degree upward position on the backing. This provides a very natural cross-draw, though it does present some other problems as I will note below. 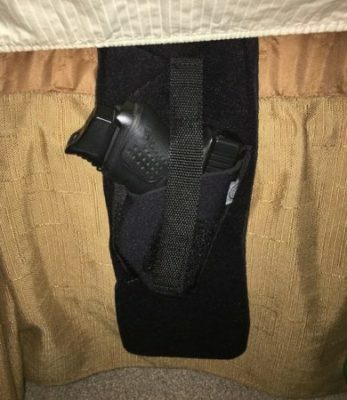 Though the holster Neoprene is slightly thinner than the backing Neoprene, I have not had any problems with holstering my Glock 27 when getting ready for duty. However, when I try to re-holster my back-up pistol while completely dressed out in uniform, the process gets more tedious. The Tagalong holster is slightly thinner than the Neoprene backing. This is not particularly different than other ballistic armor holsters I have used. If the holster’s sides are thin, or flexible (preferable for comfortable chest carry), than re-holstering underneath the uniform shirt requires a little extra effort. Despite the more difficult technique, I have found that has long as I ensure the retention strap is out of the way, and provide some space by pushing outward against my uniform shirt, I can slide the Glock 27 into place with relative ease. The holster is open tipped, allowing for longer barreled pistols to be used without hinderance. Most officers using this holster will probably select smaller pistols that will remain inside the holster, but its nice to have the option should a larger pistol be desired. The holster is sewn in a nearly horizontal fixed position. Note the scuffed area on the felt-like backing material where the retention strap attaches. The soft material of the holster is an important consideration for any user, and particularly an on-duty police holster. Though the soft sides provide desired comfort, their lack of substantial support can cause problems with re-holstering – particularly when the uniform shirt is on. 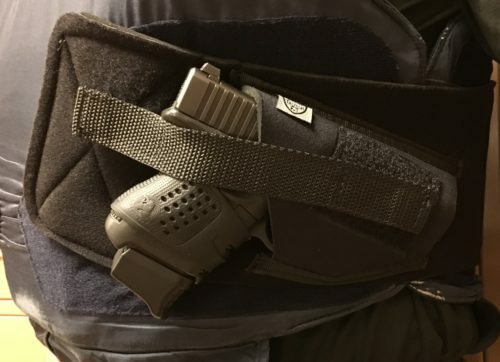 In addition, the horizontal placement of the holster tends to create a gravity concern, as well as, lowering the overall holster’s position due to the location of the ballistic armor Velcro receiving material. For these reasons I have dropped the holster rating by one. The Tagalong holster’s retention strap is made with durable Nylon that is stitched around the edges to help prevent fraying or wear. There are two Velcro patches on either end of the 7 5/8 inch retention strap. Each Velcro strap is 1.75 inches long, and 0.75 inches wide (nearly as wide as the retention strap itself). These Velcro patches are independently sewn onto the retention strap for additional strength. 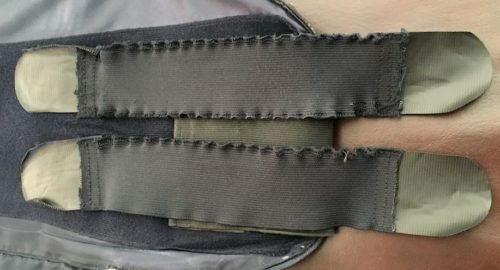 The retention strap attaches to a Velcro patch on the back of the holster but then just to the felt-like material on the outside of the backing. The retention strap by itself is very well made, and there are Velcro retention straps on the market that have proven to be reliable and durable under intense use. Several of my AR-15 magazine pouches use Velcro retention straps, and they have maintained their hold while low-crawling, crawling, jumping, running, and other heavy use I’ve put them through during SWAT missions and training. However, the Tagalong retention strap is only attached to more traditional Velcro receiving material sewn on the back side of the holster itself. This location has proven to be very effective in retention. 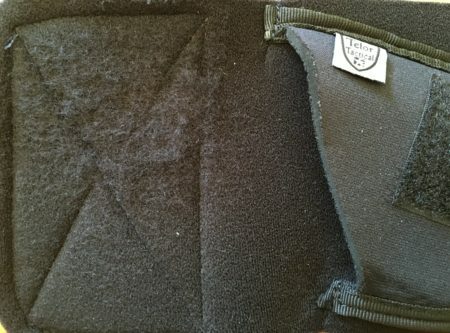 Unfortunately, the front portion of the strap that is being used to actually hold the pistol in the holster only attaches to a felt-like fabric sewn on the outside of the Neoprene holster backing. The simple felt-like material on the Neoprene lacks sufficient grip. Another concern of a Velcro retention strap in this format is the actual draw itself. Telor Tactical advertises the retention strap as being a “pull through” design. In other words, the user would grab their holstered pistol and simply pull outward. This outward force would break the Velcro hold allowing the pistol to come free of the holster. I performed numerous draws like this, and I believe it can become a more natural draw from this back-up holster. However, the officer/user needs to use as much of the Velcro attachment as possible for the best securement on the pistol. When attempting to retrieve the pistol in an emergency (the primary purpose of back-up pistols), the “pull through” method places the retention strap in the middle of the officer’s grip. The result is one of two outcomes. The retention strap gets caught up in the officer’s strong grip draw. The officer’s grip is precariously loose until the pistol is loose from the strap. Obviously practice can mitigate these negative realities, but either option still is less intuitive than most law enforcement holsters that do not have a retention strap that interferes with the officer’s grip. 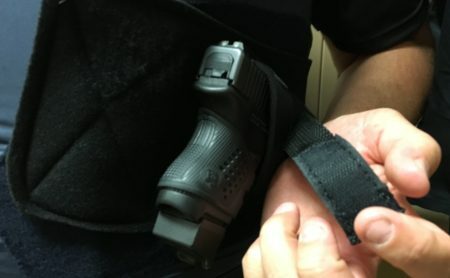 This can result in the officer resorting to the less intuitive requirement of ripping the Velcro loose to grab and draw the pistol (all under the tight confines of a tucked in shirt). This is not as easy or natural as I would have liked, and adds precious time to the draw. The different materials affect the retention strap’s effectiveness. The felt-like material on the exterior of the Neoprene backing does not provide the necessary secure attachment for the Velcro on the retention strap. I have experienced a handful of incidents where the pistol became dislodged in the 3-4 months of review. Unfortunately, it would appear the advertised design of a “pull through” draw is also a potential Achilles heel as well. Thankfully my Glock 27 is rather secure with its Safe Action safeties, and the unholstering pistol was captured between my ballistic armor and tucked in uniform shirt. However, each time this happened I felt very exposed and unprepared to enter into any type of fighting situation or shooting action. The retention strap Velcro did not have sufficient attachment on the backing. The near horizontal angle of the holster allows gravity to work against the design. Very active movement allows the pistol to beat against the retention strap, ultimately leading to the strap loosening enough to allow the pistol to escape the soft holster. 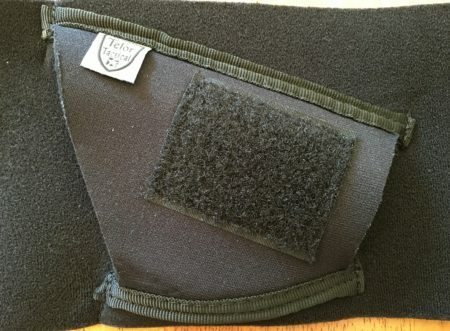 In my opinion, Telor Tactical needs to sew a significant patch of actual Velcro mating material onto the outside of the holster backing where the retention strap could be more securely attached after wrapping around the pistol. Otherwise, the retention strap needs to have a solid snap attachment that will solve the gravity and the near horizontal positioning problems made more manifest by the weaker Velcro attachment that is currently on the Tagalong. The Tagalong holster is sewn into a fixed position. The Telor Tactical Tagalong holster, as previously mentioned, is sewn onto the holster backing in a near horizontal angle, and just slightly forward of center on the holster backing. The approximately 15-degree upward angle provides a very nice cross-draw approach and grasp, but may not be high enough to overcome the gravity and retention concerns previously mentioned. The holster is permanently sewn to the backing in a nearly horizontal angle, which can allow gravity to work against retention. Many ballistic armor holsters are designed for 90-degree, or barrel straight down carry. A design of that type allows gravity to work for the officer or user, even if the retention strap should happen to become dislodged. 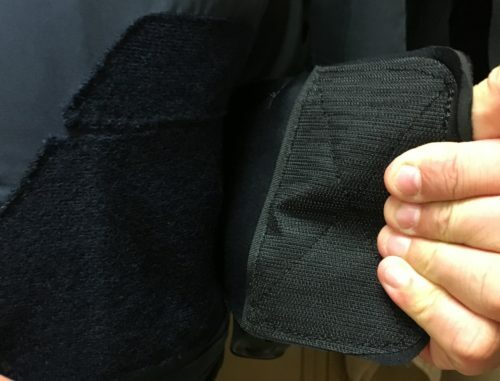 If the ballistic armor retention straps are placed over those ballistic armor holsters, officers may be able to perform strenuous activities without having the pistol become dislodged from the holster. Some of my previously used ballistic armor holsters have done just that. The more horizontal angling of some “shoulder holsters” or ballistic armor holsters, will always present a concern of the pistol becoming dislodged if the retention strap fails. Though Miami Vice made that type of shoulder holster extremely popular in the 1980’s and 1990’s, there were enough drawbacks that many officers choosing a shoulder holster switched back to barrel-down designs. As you can see from the picture at the beginning of this article, I even took the extra step of attaching the backing at a slightly upward angle on my ballistic armor. This helped a little bit with the gravity concern, but just not enough under certain circumstances. Some ballistic armor may have larger areas of Velcro attachment material to further help, but this shouldn’t be a requirement. The near horizontal mount provides a very natural draw, and the side mount was fine for me. When deciding on a rating for the holster angle and positioning I considered several factors. First, the near horizontal positioning does make for a very natural draw. That positioning can be properly implemented with a more solid retention strap. The near-middle placement of the holster on the backing likely provides the best balance of weight for the two backing Velcro attachments. However, the permanent position of the holster limits the user (for the most part) to a side body carry position. In uniform I have found the side mount to be the best location for me, so I was fine with this part of the design. However, some may prefer a position more forward for easier access for a pistol that will have to be retrieved from a tucked in uniform shirt. One of my officers has his back-up mounted just underneath his off-hand chest. It shows up more than a side mount, but makes the draw much easier. Some plain clothes detectives may prefer a more forward mount as well. 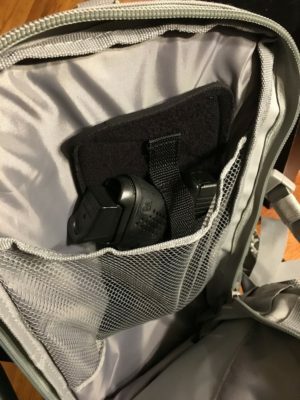 Back-pack carry – The holster can be inserted into an interior pocket (here my Exos Gear back-pack), and will remain mostly in place, particularly if there is some Velcro mating material to secure the Tagalong to. This provides concealed carry, without the sometimes cumbersome belt, or IWB, or holster pulling at your pants. The holster will be readily accessible by a forceful pulling to open the back-pack, and the exposed holster can then be drawn relatively easily. Even without Velcro attachment, the Tagalong fit nicely in the interior pocket. Motor vehicle mount – I am not a big fan of permanent pistol holsters in vehicles. They advertise you carry a firearm, and encourage users to leave a firearm in an unattended vehicle. 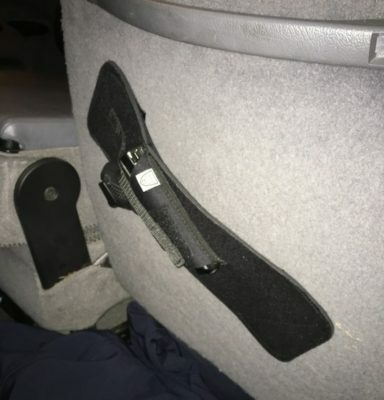 However, if the user is diligent in removing the holster when not in the car, a vehicle-mounted holster can be very useful in relieving the weight of carrying the firearm while driving and perhaps make the firearm more accessible while seated. Here, I very quickly attached the Tagalong to the fabric backing of my pick-up truck’s front seat to meet those two advantages. Vehicle mount was easy and very secure on seat fabric. Home defense mount – Defending your castle is the height of life-or-death scenarios. Having a pistol readily available at that critical time is obviously advantageous. The Tagalong can be secured to certain fabric bed liners, sheets, or skirts for quick access even in low-light conditions. With this vertical mounting, the retention strap could be totally removed for even quicker access. Here I simply tucked a portion of the backing between the mattress and box spring. Home/bedroom defense mounting was easy and very accessible. The retention strap could be removed for quicker access. With a wide range of potential uses beyond the ballistic armor mount, the Tagalong scored very well under the optional use category. The Telor Tactical Tagalong ballistic armor holster brings several great features to those who desire to carry a pistol on their ballistic armor. For the most part I found the materials and craftsmanship to be very high quality. For many of my shifts the Tagalong performed very well, and has been the most comfortable ballistic armor holster I’ve worn to date. The retention strap was the sole disappointment with this holster system. Though the nylon strap itself is strong and durable, the Velcro just does not secure well enough to the backing fabric to achieve high scores. As I mentioned, there were several times during strenuous activities that my Glock 27 became dislodged from the holster. That is an almost critical failure. However, this one feature could be remedied fairly easily with the switch to a snap retention strap. With a more secure retention strap the Tagalong would have easily rated in the 90th percentile in my scoring. The near horizontal positioning of the holster is not ideal to some, due to the battle with gravity. A stronger retention strap, however, should eliminate those concerns and the draw from that position is very natural and easy. The limitation of where the holster is carried on the ballistic armor may be a more negative feature for some. This design met my preferences, and was not a problem. Overall, I like the Telor Tactical Tagalong system, and with a fairly simple retention strap improvement this holster would be excellent. The critical question is, “would you recommend this holster for police duty use?” My answer is, “Yes, with explanation!” The Tagalong can be a viable holster, but the user has to fully understand and accept the retention strap limitations going into the selection and use of this holster system. DISCLOSURE: Telor Tactical solicited our review of this product due to our influence and focus on law enforcement products and training. The company provided the holster to us for testing, with the understanding our review would be independent and objective. We were not pressured or influenced about the content of our review. BlueSheepDog has not been paid for this review, and Telor Tactical is not a sponsor of this site. In fact, we do not accept paid sponsors so we can avoid any conflict of interests when providing articles and reviews. We make money through our Amazon associated links. If you purchase an item from Amazon using our link, we are paid 4-8% of the sale from Amazon. The price you pay is not affected at all. The Tagalong holster, was one of three holsters sent to us. Our review of the Comfort-Air LE Ankle Holster is coming soon, as is the review of their Comfort-Air Go Band holster (a rapid response holster and accessories concept). The holsters were sent to us with the understanding they would not be returned after testing.